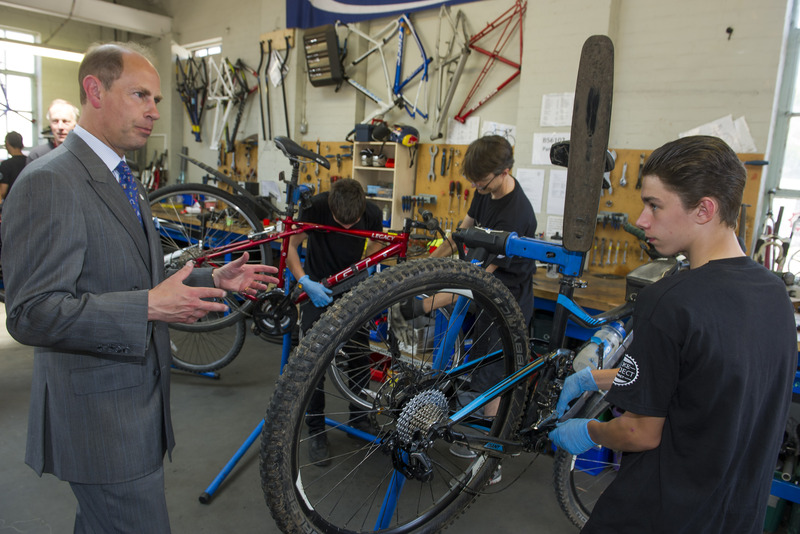 HRH Prince Edward visited Surrey Lifelong Learning Partnership’s Bike Project on 25th June to celebrate its achievements over the last 6 years and to meet the beneficiaries, volunteers and partner organisations who have made it all happen. He was accompanied by the Lord Lieutenant of Surrey, Michael More-Molyneux. 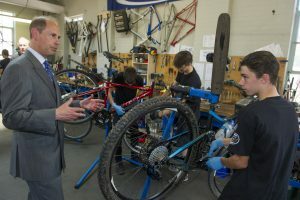 Over 80 people attended the event in Guildford where the Prince talked with those refurbishing bicycles in the project’s workshop, presented City & Guilds Certificates to learners and unveiled a plaque to mark the occasion, before finally cutting a celebratory cake. The Project was originally established with support of volunteers and Guildford Borough Council, which provides premises, together with support from the Safer Guildford Partnership and Surrey County Council. More recently it has also been established in Walton-on-Thames with support from Walton Charity. The project provides free skills, accredited training and work experience to jobseekers. Developed and managed by John Thurlow, it also generates income through the sales of refurbished bicycles which makes a significant contribution to business costs. However, it is recognised that what is needed now is to develop this social enterprise so that it is fully sustainable. All attending were delighted that the Prince took time to talk to each and every individual present personally. 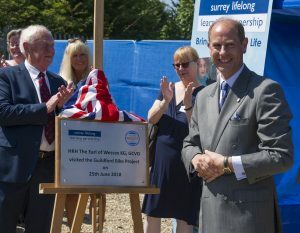 Others attending the event and presented to the Prince included Cllr Richard Billington (Deputy Mayor of Guildford, Peter Martin (Chairman, Surrey County Council), James Whiteman (Managing Director, Guildford Borough Council) and Jim Glover (High Sheriff of Surrey) who purchased a bicycle auctioned during the event. SLLP is always interested to hear from organisations and individuals who would like to offer time, expertise, ideas or resources.